This is a stellar freely improvised session featuring Rodrigo Amado on tenor saxophone, Goncalo Almeida on bass and Marco Franco on drums, recorded live in Portugal in December of 2015. "Shadow" opens the album with scraping bowed bass that is recorded beautifully, giving the sound a physical immediacy and presence. After the epic bowed bass opening, Amado's raw, rending saxophone and Franco's measured percussion enter, imposing their power upon the proceedings, burning a path through everything before them like a flaming sword and developing a strong and supple improvisation, flexing and adjusting as the music demands, creating a towering collective improvisation among equals. "Hole" and "Spring" develop deep dark growls of saxophone and howling long breaths of scaling air. Sharp percussion and plucked bass meet shorter bursts of saxophone, building a biting improvisation that surges forward. The muscular playing drives through and then open space emerges for a change of pace, with deep elastic bass and scattered percussion. Slightly softer and reverent sounding saxophone glides in, merging carefully with the other two instruments. Their improvisation grows organically encompassing the sound space by playing with wit and energy, which builds deeper as the performance progresses and choppy saxophone with drums bob and weaving in tandem. The music is further buoyed by furiously bowed bass and develops a swirling intensity. The lengthy centerpiece "Board" begins with smears of bowed bass, which is eventually met with skittish percussion. Raw taut saxophone joins the fray as the volume and intensity of the music increases. The group develops a powerful collective improvisation, drawing on a wealth of knowledge in pursuit of pure sound and vision. This sixteen minute plus improvisation is very impressive and continually evolving, finally into a filling-rattling drum solo with ominous bass in support. The concluding track, "Nail," is an absolute blast, with everyone playing their hearts out at full speed. The music surges forward like an unstoppable wave, gathering energy as it rolls on. There is soaring saxophone and vicious drumming yoked together with superb bass playing. Savage in its intensity, it is an absolutely thrilling ending to a terrific recording, one of the finest of the year to date. 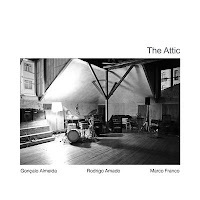 The Attic - No Business Records.